The countdown in on! The NAFEM show is just a week away and we’d like to invite you to stop by Welbilt’s booth #3200, February 7-9. See kitchen solutions that are stunning in their simplicity yet practical in their ability to help foodservice operators be successful. Check out a selection of our most innovative product and system solutions featuring Convotherm mini-combi ovens, Merrychef high speed ovens, Crem coffee machines, Frymaster fryers, Manitowoc ice machines, Multiplex beverage systems, and many more. We will be showcasing some of our latest technologies including KitchenConnect®, our premier digital solution for a new generation of connected kitchens. We’d love to start a conversation about how our system solutions can help to grow your business! Come and see us! You can’t miss us: We’ll be right at the main entrance when you enter the hall. Capture The Kitchen: Welbilt Segment Selling - Sign up today! 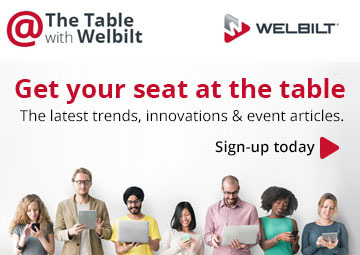 Join our team of culinary and sales experts at The NAFEM Show 2019, February 7th-9th, Orlando Florida, at the Welbilt booth 3200, as they deep dive into industry trends, identifying customer needs, and how Welbilt brands and products, when combined into a full kitchen segment-specific solution, can increase sales. *Number of gifts for each session are limited. Must attend the session to receive the gift. Participants that are pre-registered will be guaranteed their gift upon completion of the session. Welbilt World of Connectivity and Automation - Sign up today! Join us during the NAFEM Show 2019 at booth #3200 in our Connectivity and Automation Pavilion and learn more about how Welbilt is designing equipment for the future of foodservice. Choose from unique daily presentations from our top connectivity and automation experts. Register today to confirm your attendance.